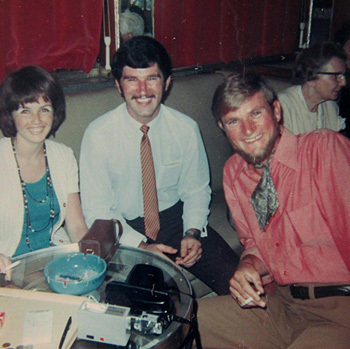 John Proffitt’s memoirs of Fire on board S.S. Australis in 1970. A cruise from New Zealand to United Kingdom on Chandris Lines largest passenger liner in 1970 sounded very appealing. Especially for John and Sue who had exchanged vows a few months earlier. It was also an exciting opportunity for the couple to visit other countries during the voyage. For John he was returning to the UK after an epic overland expedition across the world by Land Rover from England to Australia, followed by working in Australia and New Zealand where he met Sue. This is John's first hand account of the eventful voyage on the S. S Australis. 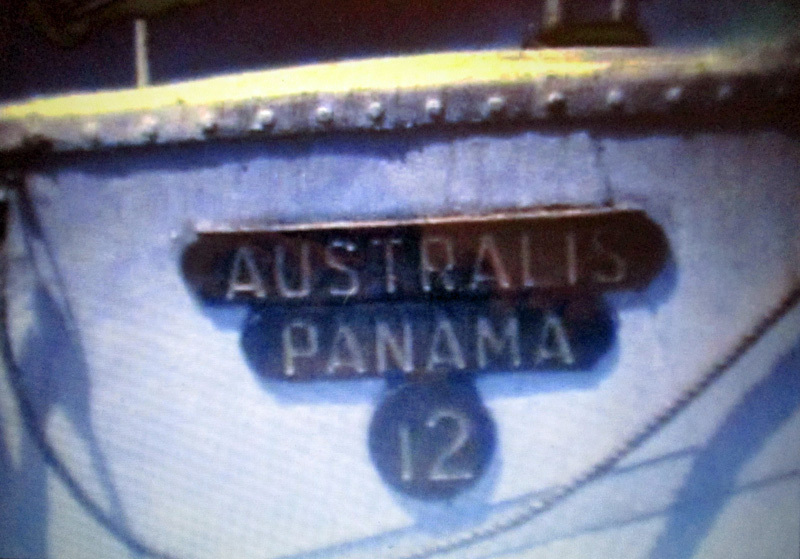 On Tuesday, 20 October 1970, we were welcomed aboard the (Steam Ship) S.S. Australis berthed in Auckland. Our cabin was located on the main deck on the port side and just aft of the stairway. A ships steward assisted us with our luggage case and a travel bag to the cabin. I can recall that as we walked towards our cabin we saw a duty-free shop we could check out later. Our cabin had two bunk beds, a set of drawers and a mirror, an en-suite and a twin wardrobe with two life-jackets inside. It was basic but very comfortable. We briefly introduced ourselves to the couple in the cabin next to ours, they were Gerry and Irene Poed. Our cabins were adjacent to a corridor leading to a flight of stairs leading to the upper and promenade decks of the ship. The ships steward informed us we have some visitors but they can’t come onboard until we go to the Pursers Office. Apparently, a friend had brought a bottle of wine to farewell us and not knowing a special pass was required by the ship for alcohol to be carried on board. The pass was issued and we kept the pass card as a souvenir. In the late afternoon the ship was bid fare-well by those at the quayside. As the ship moved away from its moorage, the crowd gathered at the wharf began waving and singing a Bon Voyage song. “Now is the hour for me to say goodbye, soon you’ll be sailing far across the sea. While you are away, Oh! Please remember me, when you return you’ll find me waiting here.” What a wonderful sound, I can still hear it now as though it was yesterday. 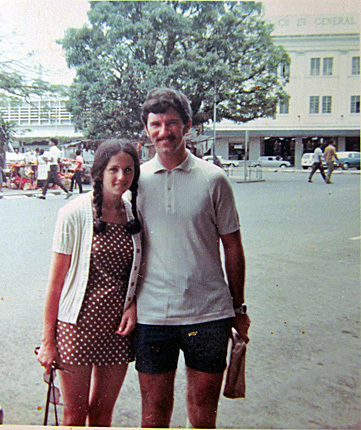 21 October 1970: The following day at breakfast in the Pacific Restaurant we met another young couple returning home to Crewe, England and two South Island sisters in their early 20’s (can’t remember their names). They were on their way to Holland to meet their parent’s families. After breakfast we explored the various decks and recreation facilities on the ship with them. The Pacific and Atlantic Restaurant’s are the main dining rooms for passengers as they were equipped with their own galleys. The waiters mostly Italian were all very friendly and helpful and ushered us to dining tables as required. The majority of passengers on the ship were dominantly of European and Western origin, some were on holiday and others as returning immigrants. The Foyer area of the ship appeared to be similar to a theatre entrance with the exquisite appearance of dark marble floors and arty wall designs. Satin drapes and beautiful antique sculptured surrounds with several picture frames captured the eye of the passengers. All passengers were encouraged by crew to read the bulletins placed on the notice-board and hand-outs in cabins that referred to life-boat drill attendance. We attended the life-boat drill so at least we were familiar with it. For most of the passengers the Captain’s welcome aboard dinner and getting dressed up was of more interest. This didn’t disappoint us, as the waiters offered cocktails and we were greeted by the ships Officers and introduced to Captain Challioris and Staff Captain Psalidas. We attended the evening dinner and heard there was promise of live entertainment in the ballroom for those passengers wishing to attend. The two sisters and the young couple from Crewe who had spent the past two years working in Australia joined us at our table in the Grand Ballroom. We were entertained with a colourful floor show that continued for most of the evening, with a live band with two very artistic male and female dancers. It was a great evening and we were all a little merry on retiring to our cabins. 22 October, 1970, 3.30am: In the early hours of the morning, I heard Sue call out, “There is smoke coming through the ventilation grill in our cabin.” We became aware the ship had stopped as there was no noise from the ships engines. After a few moments we heard a piercing alarm sound. We quickly put on some light clothes and essentials with the life-jackets from the wardrobe and locked the cabin door behind us. At first, we thought it maybe a fire drill although as we looked outside of the cabin I could see most of the passageway had a dense white smoke trailing the length of it. At the sight of this we knew this was different as there was hardly any light to see more than a few yards. I knocked on the cabin door next to ours to wake-up other passenger’s as several crew members hurried past us towards cabin areas children were staying in, they called out to make our way to the stairs. We continued knocking on cabin doors as we walked along the corridor and holding each other’s hands for what seemed like ages, crouching to keep our faces out of the smoke (using past fire training experience to good use). As we gingerly climbed up the stairs onto the deck the sky was lit up by bright stars and wafting smoke around us. I noticed Sue had her night gown over the top of light clothes she had put on in a hurry and carrying her box brownie camera in one hand. We both giggled, as I had put two T. Shirts on. With our life-jackets over the top we both looked a bit of a sight. Sue and I, cautiously walked along the deck towards the area we believed was our life boat assembly point with others following behind. A ships crewman then guided us further along to the rear or aft of the ship away from the life boats and we thought that was odd. We placed ourselves next to wooden deck-chairs and as close to lifeboats as we could. What was going through my mind at the time was the deck-chairs could float, and at least we had a seat to rest on in the mean time. A group of us huddled together chatting and I believed this was of some comfort as we watched the smoke and flames coming from the centre of the ship. It was likely the reason our group had been moved from our lifeboat assembly point at the centre of ship was to get us away from the fire and smoke drifting near our lifeboat. The ship’s crew actually let off distress rockets into the night sky followed by sending an SOS (Save Our Souls) to the nearest ship ‘Oronsay’ believed to be some distance away from us. I thought to myself we must be at least half way to Suva, Fiji, that was around 1,000 nautical miles from Auckland. A ships officer called out on the speaker that shipping in the area have been informed of the S.S. Australis present position and are steaming towards us to assist us. The ship’s officer further announced that a fire had broken out on the ship and the crew were working hard to contain it and put it out. What was of concern to me was as I looked towards the centre of the ship, the white smoke between the two funnels had turned to a very dark colour that had an appearance of oil burning with flames coming from that area. There was hardly any breeze so at least the smoke seemed to trail to the side away from us. The ships officer must have observed I had fire training as he thanked me for following the fire drill, and for guiding other passengers towards their lifeboat stations as this assisted the crew in this situation. The ship’s crew were mostly Greek, although those employed in hospitality and catering were Italian. I heard several worried passengers chatting together and one of them said, “On another ship the Greek crew had abandoned their ship and just left passengers to their own resources.” I personally did not see anything like that on this voyage and the crew of the S.S. Australis appeared to work very hard to bring the fire under control. After what seemed like a scary few moments the ship began to gradually list to the port (left) side and several passengers gasped and began to cry out. This prompted others to begin to sing hymns in a way that may console those around them. It was just like one could imagine the script to be from a movie. It became apparent that the reason the ship listed to one side was that the Fire screen water tight doors in some areas below decks had to be closed, sealed and flooded with water to cool those areas to extinguish the fire. As a result of this it was likely that the ship listed with the unbalance of water. Unfortunately, a number of passenger cabins may be affected. We were hoping it wouldn’t be ours, but the priority was to get the fire out on the ship. What was also of concern was there was 18 lifeboats visible on the ship, probably insufficient for all the 2,446 passengers and 586 crew. What also added to the anxiety was only two life-boats were operable. These were used as tender boats in the event there was no place of moorage at a port for a ship of this size. They were lowered to deck level in preparation for passenger’s to board them if required. When it came to lowering the other lifeboats, it appeared the round rollers that guided the cables to lower the lifeboats had surplus paint on the rollers and cables restricted their movement causing them to jam. It was observed a crewman took a fire axe to the paint on the roller and cable. This appeared to release it enabling the life boat to be lowered. Several worried passengers asked a crew member if the other ship was still coming to help us and he replied, “It is some distance away.” “The fire is almost under control now, so an announcement will be made soon to update everyone.” Despite all that was going on around us I looked at Sue, who appeared to be very calm and alert to the situation we found ourselves in. I was really proud of her as our situation was not for the faint hearted. As dawn arrived and daylight, the ship was just drifting with engines stopped. The black smoke that was coming from between the funnels had turned to a light grey colour so it was of some relief, if it was oil that was burning earlier it was not burning anymore. One of the crew who earlier appeared apprehensive about talking with us, probably worried about his job told us, “The fire started in the galley as one of the cooking vats with oil had ignited somehow.” The fire had quickly ignited other areas as it was believed both the ships galleys had been on fire, spreading to a number of passenger cabins above and in close vicinity. There was more gossip from passengers on board who thought they heard one of the crew say, “someone had flicked a cigarette from the deck and it had flown through an open porthole igniting a fire in the galley.” I suppose it could not be ignored and believe it was considered by the ships officers. Some time later all portholes were required to be bolted closed during voyage. The sun became very strong and glary and there were hardly any places left on deck to shelter which meant we were exposed to the elements. The few toilets available for use on the deck of the ship were gradually breaking down with the constant use by passengers and just three of them were now operable for all the passengers. The crew members became aware that more toilets were needed. They appeared to be rigging up a temporary outside toilet with a frame and canvas cover at the end of the ship where clay-pigeon shooting took place. We assisted the crew to secure the canvas so it didn’t act as a wind sail. A water hose with detergents was placed by it to flush the area for hygiene purposes. This seemed to work well for those passengers who wished to use it during the daylight hours as it reduced the queue for the remaining three toilets still working. Many of the passengers on board became thirsty and were getting hungry. The ships officer requested crew members to go below decks to salvage provisions of biscuits, cheese and juice from ships stores. They returned with food that was placed on temporary foldaway tables on the deck of the ship. Some passengers in their haste appeared to grab at what they could get, until the ship’s crew brought some kind of order by insisting passengers must line up in a queue and to take just one of each of the food items. In the late afternoon an announcement was made that the fire crew have got the fire under control and they hope to start the ships engines and begin to sail on ‘Dead Slow’ with the ships controls as not to create a draft to re-ignite another fire. Several of the passengers gave out a cheer, but appeared tired and exposed from sun. The passengers were now allowed to go inside the ballroom area of the ship to rest. On our way there I decided to take a couple of snaps of fire damage with Sue’s box brownie. I cautiously snapped away although others were challenged by crew and cameras were taken from them. I couldn’t let this go without some recording of what had taken place. Burn marks could be seen on external and internal walls and charred drapes hanging down and it became evident that both galleys and one of the dining rooms on the ship were seriously damaged. We found a really nice area with upholstered seating and the couple Irene and Gerry from the cabin next to ours joined us. Irene was from Queensland and Gerry had migrated to Australia from Germany and were on their way to Europe to meet relatives and friends. We waited in this area for a couple of hours until crew informed us that we could return to our cabins. A middle aged crew member was going around to each group of passengers asking them how they were. When he came to us he asked us if they could do anything for us. It was realised he was the ship’s Captain Challioris dressed in engine room clothes. He told us, “It was a miracle no one had been hurt in the incident and the crew had worked around the clock to put the fire out.” “They planned to have repairs done to the ship once they arrived in Suva.” “Chandris Lines were flying out experts from Greece to Suva (Fiji) to do the work on the ship.” He thanked us for our patience and especially our initiative for helping the crew and other passengers. We both thought he was a really nice man and appeared appreciative for our offers to assist during the emergency. On Friday, 23 October at 5pm the ships’ officers began to place lists of cabins and instructions on the notice board to let passengers know if and when they could go back to their cabins. Around 8pm that evening we were informed we could return to our cabin. We couldn’t wait to get to our cabin to freshen up. On arriving back, I noticed that just a few feet from our cabin they had closed off the fire screen water-tight doors in that area. The idea of this was to cool the deck above and below the cabins by discharging the water sprinklers to prevent fire from spreading. I opened our cabin door as I had locked it prior to leaving in the early hours that morning. Everything appeared to be dry and our clothes were still in a suitcase in the wardrobe as we had left them. We were very lucky as we could have been faced with all our belongings being water damaged or burnt similar to those cabins just a few feet away from us. We slept uneasy that night and intermittently checking the ventilation grills in the cabin to ensure no fumes were present. We considered ourselves lucky, as we were unscathed in this incident, except for a little smoke inhalation at the time of the fire, exposure to the tropical elements, sunburn and a little hungry. The next day Saturday, 24 October we went up to the Promenade Deck to see if there was any food and drink available. Passengers were still queuing up and waiting for the crew to open tins of meat they had salvaged and brought up from the galley stores. It became apparent that there were a number of passengers who had not been able to return to their cabins gutted in the fire or seriously water damaged. It was believed that over 40 cabins had been lost in the fire. I observed two couples who were disorientated and had slept in the lounge area all night. They had returned to their cabins with crew members to assist them. They were now putting their wet and empty suitcases outside to dry with the contents lying on the deck. Several of these people were walking around in their pyjamas with no shoes. I offered my blue T. shirt to a man, who looked embarrassed but appreciated something to wear. I noticed these passengers placing their life-jackets in a heap on the deck as they had been worn and soiled. The ships officer requested the crew to have them sanitised and repacked. There was also a number of discharged fire extinguishers that needed to be re-serviced at some stage. It was another warm day and the ship was moving along a lot quicker now as the ships officer believed it was now safe to sail at up to 18 -22 knots. There were a number of complaints made by passengers, especially those from Europe who were giving the ship officers a hard time. The crew responded very well considering they were very tired and having to work through this. Those passengers who lost everything were offered the opportunity to fly-out from Fiji on the next available flights. Another liner was due in port and could take over 150 passengers. Chandris Lines made this offer to other passengers as many were traumatised by the experience. Those left who wished to stay with the ship until it was repaired could stay on at various Island accommodation at the expense of Chandris Lines. We were in no rush so decided to wait for the ship to be repaired. On Saturday, 24 October at around 5pm the ship arrived in Suva and was moored on the main shipping wharf. There was a crowd of people there to greet us including locals dressed in island clothes, very flowery and a local band playing. There was also a large contingent of local Fijian Police wearing skirts. Also there were the press waiting to interview the crew and representatives of the ship and any passengers. The realisation of it all was that a large numbers of passengers had decided to disembark from the ship and keen to let the world know of what had occurred. On the other hand Chandris Lines appeared to downplay this emergency. I felt a tinge of sadness for those passengers that lost their belongings. I kept looking for the couple we saw on the deck whose belongings were burnt and water damaged. At that moment, I observed the man who was wearing my blue T-shirt walking down the gangway, he turned around and waived before disappearing in to the crowd. Once those passengers had departed from the ship we were informed there was concern of the ships air-conditioning to the cabins and both restaurants and galleys were affected as a result of smoke during the fire on ship. Also paint fumes will not make conditions safe for passengers to stay in cabins during repair work. We were told coaches would arrive to pick us up with the ships agent present, and then take us for our meals to the Island hotel resorts around Suva. We were advised to take an overnight bag and a change of clothes. This turned out to be a real treat for the first night as the ship booked us in to a modern Hotel ISA LEI that was designed in the shape of a Turtle, including the swimming pool. Each day we were taken on coach tours around the island and dined out until the ship was repaired. This was all provided by Chandris Lines at no extra cost to the passengers. After two nights ashore, we were informed by the ship our cabin was now habitable and well ventilated and it was safe for us to return to the ship. Once we boarded we found our cabin had been cleaned. The coaches still arrived each day to pick us up and take us for all our meals ashore and for tours around the Island until the remaining passengers could return to the ship. On Friday,30 October, we were informed that the ship would be sailing in the early evening from Suva as the ship had received a health certificate and was deemed sea-worthy. An Island farewell was planned and a Fijian cultural group gave a rousing fare-well to passengers and crew on the ship in the Grand Ballroom on the ship and then from the Suva wharf. The ship sailed around 6pm following Island drum sounds and singing from the people of Suva. During the rest of the voyage the ship visited Acapulco, Balboa, Panama City and Panama Canal. The ship was scheduled to visit Miami, but delays as a result of the fire rescheduled the ship visit to Curacao then onto Southampton our final destination. This part of the journey went without incident and with fewer passengers VIP treatment was experienced on board ship. The S.S. Australis was the largest passenger liner in the Chandris Line Fleet. In 1970, as a passenger liner it could take up to 2,446 passengers and 586 crew. It was a sister ship to RHMS Britanis (Royal Hellenic Mail Ship) and RHMS Ellinis. It was previously known as ‘America’ and was the largest American ship built at the time. During WWII it was named ‘USS West Point’ as a troop ship until 1946. The photos below were taken by John in the dining room, also a boarding pass and a couple of photos taken fter the fire.